That is what all 12 teams are going to ask themselves on August 24 when they return to enter the stretch run after the quadrennial Olympic break. Before then, some of the league’s best talent will be headed to Rio to compete for their respective countries. Some of the league’s brightest young stars will make up the U.S. Select Team, which will prepare the 2016 U.S. Olympic Women’s Basketball Team in the run-up to the Games. Meanwhile, many others will get a much-needed opportunity for rest and rejuvenation. Teams with momentum will have to figure out how to keep it when they get back. Teams that are struggling will be looking for a way to change their fortunes in time for what is shaping up to be a spirited competition for the last playoff spots in the league’s new, intriguing postseason format. Regardless, everybody has work to do. Vacation, after all, can’t be all play. Here is a look back, as well as a look ahead, for all teams in the league, starting with the top teams in the West. Two straight losses at the end of the season’s longest road trip don’t necessitate alarm bells. The Sparks have played so well to this point that they’ve already clinched their playoff spot and will make a fifth straight postseason appearance. And more than in any of those years, they look like a team that can win a title. What do the Sparks need to do after the Olympic break? Keep up the good work. Keep getting the ball inside to Nneka Ogwumike, who is having perhaps the most efficient offensive season in league history, and maintain their stellar level of defensive play and the chemistry that led them to match the 1998 Comets for best start in WNBA history at 20-1. The Lynx, like the Sparks, have nailed down a playoff spot and have a five-game winning streak going after Wednesday’s win versus resurgent Atlanta. Minnesota has won at least 20 games for the sixth consecutive year, matching the Sparks for the longest such streak in league history. 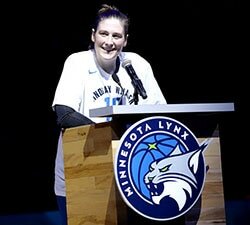 What do the Lynx need to do after the Olympic break? Turn up the defensive pressure. Minnesota, already the league’s highest scoring team, knows how to navigate the postseason and it knows that its best shot at another title is smothering the opponents’ offensive options during the stretch run. The Mercury are still riding the roller-coaster. First a win without Diana Taurasi, Penny Taylor and Candice Dupree on Saturday. Then a loss with Taurasi and Dupree back on the floor on Tuesday. The team that was picked by WNBA GMs to win the 2016 championship has dealt with their share of frustration this season. Maybe a break will do them good. What do the Mercury need to do after the Olympic break? Reel off a bunch of wins. Not just for the sake of solidifying their spot in the standings, but to get some momentum going for the first time all year. Here’s guessing Taurasi thinks the roller-coaster needs to come to an end. The Storm are figuring it out and putting themselves into playoff position with three wins in five games heading into Thursday’s pre-break finale against the Lynx. 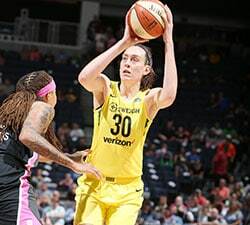 Breanna Stewart is having a great debut season, Jewell Loyd is better than she was a year ago and Sue Bird is warming up for what is likely her final Olympics with her best offensive season in the past several years. What the Storm need to do after the Olympic break? Win on the road. Six of Seattle’s last 10 games will be played in someone else’s gym. The young Storm are 3-7 on the road for the year. The Wings are reeling. 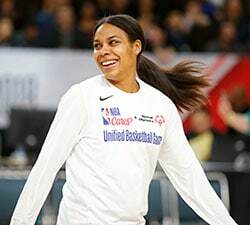 With five straight losses, an injury to Glory Johnson that has sidelined her since July 8 and just two wins in their past 10 games, confidence could be eroding in Dallas. Just in the past few days, Dallas hung with Minnesota before losing in overtime and then fell to Connecticut at home, the last-place team in the East. What do the Wings need to do after the Olympic break? Find a way to win the tough games and hope that Johnson is back on the floor when the action picks up again. Her production makes a big difference for them. This season hasn’t yielded much success for the Stars, who have the league’s lowest-scoring offense and are now playing without their leading scorer, Kayla McBride, who is out for the season with a foot injury. San Antonio has won one road game all year and looks like the only team who might already be truly out of the playoff chase. What the Stars need to do after the Olympic break? Continue to develop their young talent. Moriah Jefferson and Dearica Hamby have been brights spots for the Stars, and nurturing their growth will only bolster the team’s fortunes next year when it seemingly will get back a pair of All Star guards in McBride and Danielle Robinson. The Liberty are 9-2 against Eastern Conference teams and 8-6 against the West. Tina Charles leads the league in scoring and rebounding and Sugar Rodgers has had a breakthrough season as the No. 2 option. The Liberty could use a third player to step up and offer consistent scoring, but Wednesday’s game against Washington, in which New York set the league record with 69 bench points, is an interesting way to go as well. What do the Liberty need to do after the Olympic break? The biggest thing the Liberty need to prove is that they can be a true threat to the power teams out West. The Dream jumped out to a fast start (winning six of their first seven) and then stumbled almost as quickly (losing eight of their next 10). But a decisive win on Sunday over the Sparks — handing LA only its second loss of the season — proves that the Dream’s season is not nearly over. Atlanta, with its balanced scoring — four players are averaging double figures — and relentless pressure on the ball, can be a factor in the stretch run. What do the Dream need to do after the Olympic break? Beat the big-timers. After the break, Atlanta has two games against Phoenix, and one each against LA and Minnesota to go. Knock off these teams and you will prove to be a true postseason threat. With just 10 regular season games left in Tamika Catchings’ illustrious career, the Indiana Fever are playing like a team that wants to give her a great send-off. The Fever have won five of their last six games. Forward Lynetta Kizer is averaging 17.8 points over her last four games and the Fever have won seven of 10 since Kizer moved into the starting lineup. Catchings, meanwhile, has her highest shooting percentage (45.4 percent) in six years. What do the Fever need to do after the Olympic break? Win at home. The Fever come off the Olympic break with three straight home games and have two at home in a row to close the schedule. Win those – for Catch, and departing coach Stephanie White – and a playoff berth is the likely reward. The Sky could’ve be considered one of the league’s biggest disappointments in the early going, but Elena Delle Donne’s stellar play seems to be leading her team in a better direction as Chicago has won four of its last five games and moved into stronger postseason position. Delle Donne, the reigning MVP, has averaged 23.8 points and 8.5 rebounds in July. What do the Sky need to do after the Olympic break? Win the games they should win. Seven of Chicago’s 10 games after the Olympic break will come against teams currently with losing records. The Mystics have lost six in a row, which is a tough place to be when you are about to host the powerhouse Sparks in your pre-break finale. Washington’s offense is second-worst in the league, and the lineup keeps changing due to injuries. With 11 games to go, the Mystics are clinging to the last playoff spot and a timely turnaround starting August 24 is a must. What do the Mystics need to do after the Olympic break? Get healthy. Tayler Hill, Ivory Latta, Natasha Cloud and Bria Hartley have all been playing through injuries this season. Rest will do this team as much good as any in the league. The Sun are showing signs of life as Chiney Ogwumike is coming on strong – she’s averaging 17.2 points a game over the past five games. Connecticut is 3-3 in its last six games, two of those wins coming on the road. And in a pair of losses to Los Angeles and New York – the Western and Eastern Conference leaders, Connecticut lost by an average of 6.5 points. What the Sun need to do after the Olympic break? Win games against Eastern Conference teams. The Sun are 1-9 in their own conference, and still not far out of playoff positions. They need to knock off the teams above them to earn a playoff spot. Longtime WNBA reporter Michelle Smith will have a weekly column on WNBA.com throughout the 2016 season. The views on this page do not necessarily reflect the views of the WNBA or its clubs.